Minister of Welfare, Women and family Development Datuk Fatimah Abdullah (front row, 5th left),Assistant Minister of Law, State-Federal Relations and Project Monitoring Sharifah Hasidah Sayeed Aman Ghazali (front row, 3rd right), Assistant Minister for Women, family and Childhood Development, Rosey Yunus (4th right) and Member of Parliament for Sibuti, Lukanisman Awang Sauni (front row, 4th left) with others singing the ‘Puteri Santubong’ song at the closing of the event. 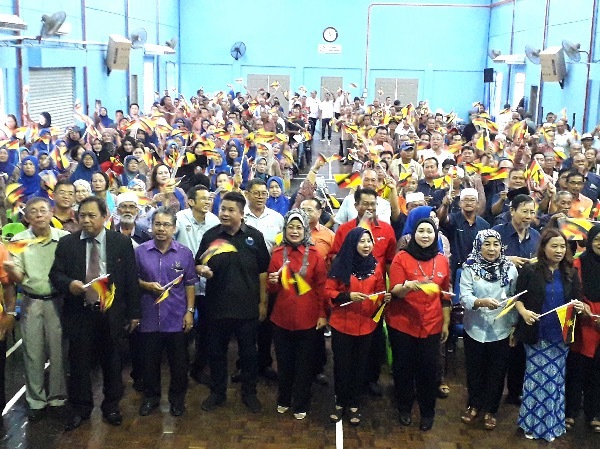 MIRI: More than 200 members of Parti Pesaka Bumiputera Bersatu (PBB) Bekenu branch attended a talk on the Oil Mining Ordinance (OMO) 1958 and the Malaysia Agreement 1963 (MA63)at the Bekenu Community Hall near here, yesterday. Also present were Minister of Welfare, Women and family Development Datuk Fatimah Abdullah, Assistant Minister of Law, State-Federal Relations and Project Monitoring, Sharifah Hasidah Sayeed Aman Ghazali, Assistant Minister for Women, family and Childhood Development, Rosey Yunus and Member of Parliament for Sebuti, Lukanisman Awang Sauni. The talk was meant to enlighten the party members and Sarawakians as a whole to the meaning of OMO58 and MA63. “Today’s event is meant to convey information on OMO58 and MA63 to Sarawakians,” said Rosey in her opening speech. “In this respect, only with such understanding will the people of Sarawak better understand the meaning of to love the state,” she pointed out. During the two-hour talk, those present were briefed on the history of the establishment of OMO58 and MA63. Assistant Minister of Law, State-Federal Relations and Project Monitoring Sharifah Hasidah Sayeed Aman Ghazali said the OMO58 stipulates that all oil and gas industry players in Sarawak including Petroliam Nasional Berhad (Petronas) should comply with it. She asserted that the State government can gain revenues from licences or permits imposed on all players including Petronas. “With this revenue, we can use it to improve basic facilities, especially in the rural areas, without having to wait for decisions made by the Federal government. “OMO58 clearly stated of Sarawak’s authority and power to regulate the oil and mining industry,” she stressed. She further added that according to the Department of Statistics Malaysia, Sarawak’s total export from the oil and gas industry was at 27 million metric tonnes. “RM9.4 billion worth were exported from the State…meaning to say that Sarawak has contributed 30 per cent of its gas and oil industry or 60 to 65 per cent overall of the country’s gas and oil industry,” she said. On July 16 this year, Sharifah Hasidah led eight experts including lawyers to London for a week in a fact-finding mission on the MA63, which helped the state to be factual in their discussion with the federal government on the state’s rights. “On December 2017, based on Petronas’ data, a total of 41 production sharing blocks (exploration and development from oil and gas field) or PSC are available on the Sarawak border,” she said. Hence, she called on the people of Sarawak to give their undivided support towards Sarawak-based political parties led by Chief Minister Datuk Patinggi (Dr) Abang Johari Tun Openg to fight for Sarawak’s rights. Meanwhile, Minister of Welfare, Women and Family Development Datuk Fatimah Abdullah who is also PBB women chief, urged PBB members at the grassroots level not to be too complacent. “We have two more years before the election to prepare and work hard to solve any issue in the respective constituencies. “Do not be complacent, it is a matter of do or die. Find issues and solve them. Don’t wait until election comes to solve issues,” she pointed out. Over 200 PBB Bekenu members attend talk 0 out of 5 based on 0 ratings. 0 user reviews.